hink back to the fantasy play of your childhood. Now think to the fantasy play of your children. How many hours do children spend zooming toy spaceships around the house while da-da-da-da-ing the Star Wars music, or rampaging a toy dinosaur through a building block tower while ba-da-da-bum-bum-ing the Jurassic Park music for dramatic emphasis? How many times did we, as children, safety-pin a towel around our necks as a cape and run around the house bum-ba-ba-ba-ba-ing the Superman theme as we “flew”? Every stick my son finds on the ground suddenly becomes a magic wand. A quick “swish and flick”, with the requisite bum-bum-ba-da-bum theme from Harry Potter, and in his imagination he’s just transmogrified his sister into a frog. Fantasy is such an integral part of childhood, and so often the musical themes of those fantasies are inextricably linked the fantasies themselves. The music can be so firmly associated with the fantasy that one cannot be expressed without the other. 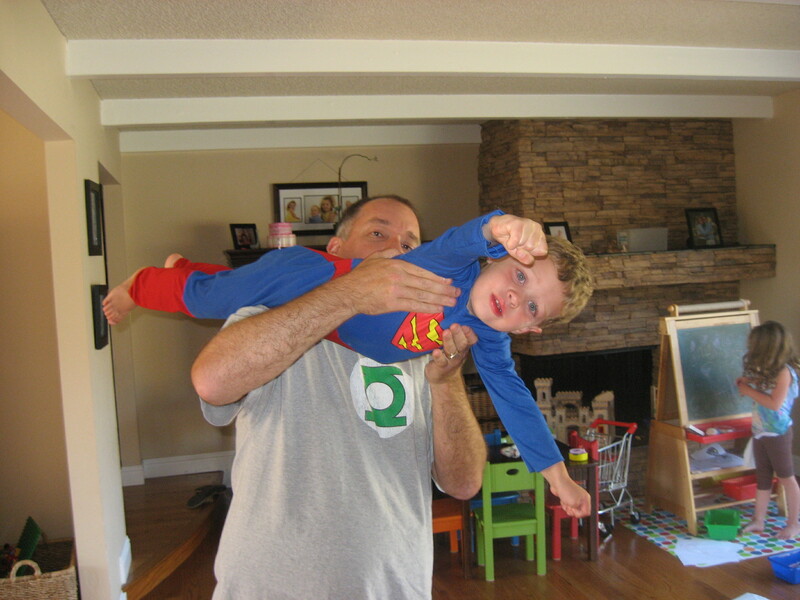 I’ve blogged about it before, where for a time I couldn’t play the Superman music in my home without my son demanding that I pick him up and “fly” him through the house. Where make-believe fantasies are concerned, you simply cannot pick up a red lightsaber and wield it without bum-bum-bum-ing Darth Vader’s music at the same time. They were all written by the same man. John Williams. If you haven’t heard that name before, John Williams is the most successful, and perhaps the most important movie music composer of all time — so much so that filmscore enthusiasts literally mark time before and after Star Wars. He is responsible for returning the classical, symphonic sound to movie music, and for inspiring an entire generation’s fantasy-play with bum-bum-bums and ba-ba-ba-ba-bas. Nobody in history has been nominated for more academy awards. He has scored every movie Steven Speilberg has made (except “The Color Purple”), and as far as sheer volume of work over a career, he has composed more hours of music than Tchaikovsky, Motzart and Bethoven… PUT TOGETHER! 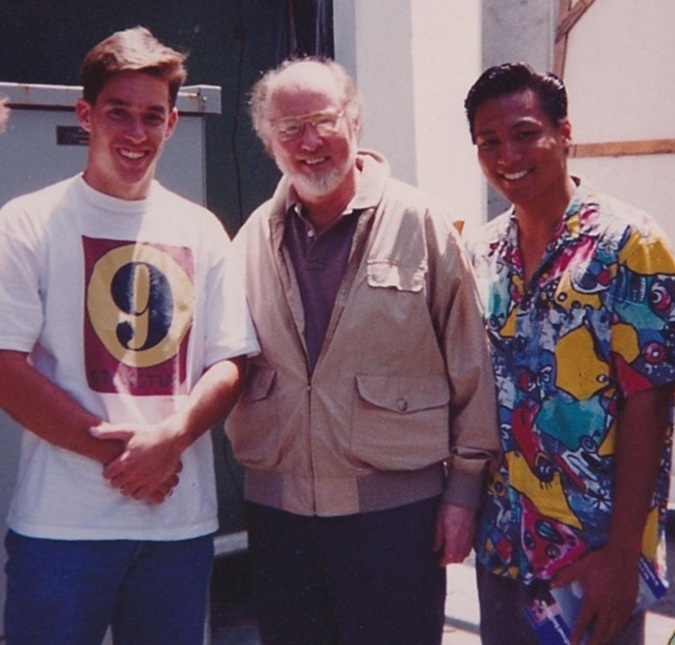 That skinny guy on the left, next to Maestro Williams… yeah, that’s me circa 1993. His influence isn’t limited just to movies. His work is all over network television too. Themes you strongly associate with other well established small-screen legacies, likely he has written as well. If you stop and think about it, what characters are so strongly associated with a musical theme that you can’t help but think of the character when you hear the music? The Lone Ranger. James Bond. Everything else is John Williams. John Williams turned 81 last week. It seems as good an excuse as any to ruminate on how Maestro Williams’s work has influenced us all. I cobbled together a little video montage to give you an idea of just how strongly his themes have worked their way into our cultural DNA. Not everything is from the movies. Some of the cues will surprise you. Watch it with your eyes closed if you like. You’ll know exactly what images the themes are referring to the moment you hear them, and the themes you do hear are only the smallest fraction of his total catalogue. Truly, his work has become the soundtrack of our fantasies. Fantastic! Great blog today. Loved the John Williams tribute. Thank you for putting it together. Thank you for not pointing out how dissimilar the skinny guy in the picture is from the dude carrying the little Superman. I had read that one before. Unfortunately my head is full of my newest passions right now, the BBC version of Sherlock and Game of Thrones. Neither are providing me with entirely appropriate names. Wow! I didn’t realize that all these great soundtracks came from the same person. Thanks for sharing! And the crazy thing is, that doesn’t even scratch the surface. Well written. I’ve been a fan of his for just about my entire life and it’s still stunning to take a moment and think about how his work is such an inherent part of so many amazing things. And it’s wonderful how it lives on today, and I’m sure for generations to come. I loved playing John Williams’ music when in High School Band!! He had such good bass runs and often let the lower brass take center stage. What a great tribute to an amazing composer! I find soundstracks composed by Williams because no matter the movie, the story, the genre all of his works that I’ve come across have been brilliant. They inspire the imagination of young and old.